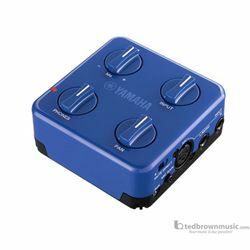 The blue Yamaha SC-02 is a portable battery-powered audio mixer designed to provide a compact amplification and monitoring solution for musicians and vocalists practicing and recording at home or abroad. It features a mono XLR input for a dynamic microphone and two 1/4" Hi-Z inputs for guitar, bass, or keyboard. The built-in mixer allows you monitor your source via headphones without needing an external power supply. Use the supplied 3.5mm TRRS cable to connect a smartphone or tablet to the stereo 3.5mm auxiliary input. Plug in headphones to the 3.5mm headphone output, then play along with music from your device. Front-mounted controls deliver simple control over level and panning adjustments.